Asparagus symbolizes spring. Spring symbolizes a time of growth and renewal. I have been buying asparagus almost weekly since first appearing at the farmers market. The first time I prepared asparagus soup with shredded hard-boiled egg. Love that asparagus can be steamed, boiled, grilled, fried, sautéed or stir-fried. But have you ever thought of a custard? If you are looking for something different, check this out. It’s creamy and delicious. First the asparagus is blanched, cut into pieces and then blended with eggs, milk, cream and chicken broth. Once this is done you let it rest, to let the bubbles settle. After ten minutes or so; pour into ramekins and then simmer in a water bath. This custard can be prepared in smaller ramekins and served as appetizers, before or after a meal, it’s your choice. Just remember to enjoy as soon as possible because the fresher the better. As I was ladling the liquid into the ramekins my thoughts were all over the place. Not having much custard experience the directions for this recipe were fairly vague. Was I using the right size of ramekins? should the eggs have been at room temperature? Since the recipe did not call for room temperature I used eggs right out of the fridge and the ramekins, I eyeballed. Everything turned out as expected except the “bath” time was double. If you decide to try this recipe, keep an eye very closely on the simmering part of the process. This recipe has been adapted from The Broad Fork, a cookbook by Hugh Acheson. Prepare ramekins, lightly spray. (I used Five 7 ounce). Bring a medium saucepan of water to a boil. Blanch asparagus for 1 minute. Dunk in an ice bath to stop cooking. When cool, drain and cut off top 2 inches and set aside. Cut the rest of the stalk up into 1/2 inch pieces and place in a blender with eggs, cream, milk, chicken stock and salt. Blend until smooth. Strain custard base through a sieve. Let rest for 10 minutes, then divide among ramekins. Tightly wrap each one with plastic wrap. In a wide bottomed pot add enough water to cover ½ of the ramekin and bring to a boil. Lower heat to a simmer, add ramekins, cover and let steam for 15 to 20 minutes (you want the eggs to steam gently)(this is where it took double the time 40 minutes). Custard is done when mixture wiggles just a second when shaken, then stops. Serve warm or chilled, garnish with reserved asparagus tips. Enjoy! What a wonderful way to say HI to Spring, Cheri...I'm so glad the recipe worked out for you. I would be soooo nervous making any kind of custard. Hi Louise, I was actually kind of nervous myself, not real confident making custards but this turned out just fine. Happy Tuesday! I have not heard of asparagus custard before. It looks like it turned out nice an creamy and delicious. Spring can come fast enough for me. Hi Dawn, I was surprised........my husband was a little leery at first, but he really enjoyed this. Interesting! Looks so creamy and delicious. Thanks Dena, I was very surprised about how much flavor shone through, learned another technique for that process. Hope you week is going well. We love asparagus soup, but I have never made asparagus custard. I think it would make a nice change though. Hi Dannii, it's different but it taste just like asparagus. This sounds delicious…I love asparagus. Thanks Karen, I do too. Very unusual, Cheri. And we love asparagus! I've never made it custard form though...very elegant. Thanks Barbara, I love asparagus as well, especially when it's very fresh. I love asparagus soup, but this is a step up from soup! As Barbara said, this looks very elegant. Sounds like a wonderful dish and I'm glad it worked out! Thanks Marcelle, was not sure if the custard was going to turn out at one point, but it did. 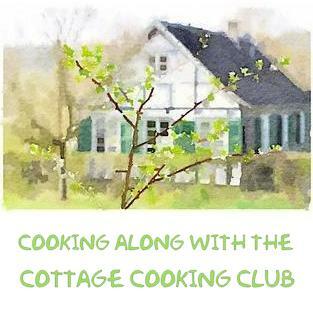 What a fantastic spring recipe! These look mouthwatering, Cheri. Thanks Angie, the custard tasted very much like asparagus. We're just beginning to get good asparagus. And yes, I've been using it. A lot! Haven't made a custard with it, ever. Really need to try this -- fun dish. Thanks! this is a first! i've never come across a savory custard, much less one made from asparagus! i'm delighted by this, cheri, and excited to try it out! Thanks Grace, hope you get the chance, savory is good. I like the green color, looks always healthy :) Great recipe. Let me make it soon! This is very doable. I'm wondering if they would bake in the oven a little quicker. Have to admit, I've never been adventurous with asparagus. But I like the idea of these with a crisp salad and crunchy bread. Hi Johnny, I should of checked your site, you are a genius when it comes to custards, I bet they would bake much quicker in the oven. Asparagus is the epitome of spring, and these custards look amazing, Cheri! Thanks Marcie, it sure is. Thanks Regine, appreciate you stopping by. I love creamy soups that are vegetable inspired so I can't wait to get my hands on this! PS, I love those bird decorations you included! Thanks Pamela, my sister gave me the birds, they are placecard holders for a table, but I use them for decorations around the house. So spring like, when I see asparagus I think of spring and your light and lovely custard is the perfect Spring treat. Thanks Suzanne, you are so sweet. Looks fantastic Cheri, so colorful too maintaining that lovely green shade through the cooking process. Hi Peggy, blanching is what seems to keep the color in. Thanks for stopping by. I am so excited for spring and asparagus season! This custard sounds fantastic! Thanks Kelly, me too. Love all the seasonal fruits and veggies. So rich and green! I am already wishing I could lick my spoon! Thanks Abbe, it's amazing how much these taste like asparagus. Hi Tandy, looks like eggs right out of the fridge did not matter at all. Take care. This is such a great idea! Not tried it with asparagus before, bet it tastes great. Thanks Caroline, it does, even my husband loved it. This is a fascinating recipe! I've never heard of it before but adore asparagus so I know I would love it. Have a wonderful weekend! How creative! Maybe even a St. Patrick's Day idea? I love this! You are so right Cathleen, this would be good for St Paddy's day too, no dye in this though. What a creative and fun dish, I make savory custard but never with asparagus, adding to my must try list. Thanks Norma, would love to hear more about your savory custards, can't wait to see how your garlic in containers works. Oh Cheri, I've been buying asparagus so much these last couple of weeks. Love it and I love any kind of custard involving eggs. This is a lovely recipe. Thanks Monica, yes me too, sounds like we are on the same page, I have been buying some everytime I go to the farmers market. Take care! This is such a fantastic recipe, Cheri. 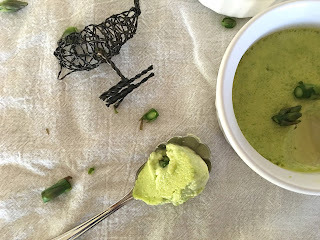 Love this idea of making asparagus custard. I need to add this to my tp-make list. So good. Thanks Anu, this was a fun recipe to prepare, I learned a lot. This looks so good. But it's funny - I love asparagus so much on its own, that whenever I buy it, even for a recipe, I eat it as is! I know what you mean Beth, it's one of my favorites too. Thanks Nancy, this tasted just like asparagus too! Asparagus totally means spring - I've started seeing it pop up at the farmers market! This looks so interesting, definitely a new use for asparagus I'll have to try. Thanks Phi, hope you get a chance to try this. Have a great week-end! Thanks Kim, I probably need help, just picked up more asparagus again today. Thanks Moumita, asparagus is one of my favorite veggies. I love recipes with a few simple ingredients that truly let the flavors shine. 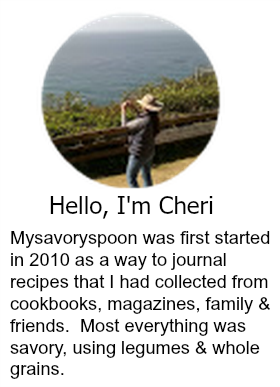 A truly beautiful dish, Cheri - love the photos, too! Oh, Cheri - this is lovely! It reminds me of something my mother used to serve. I am so excited to try it.